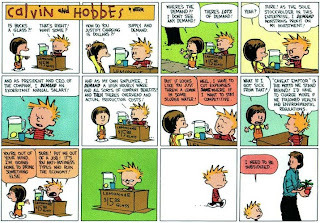 This classic Calvin and Hobbes cartoon so perfectly captures the state of the arrogant, selfish, greedy, corporate culture in America today; and of course, its benefactor in our government, the Republican Party. That's pretty funny, Splash! 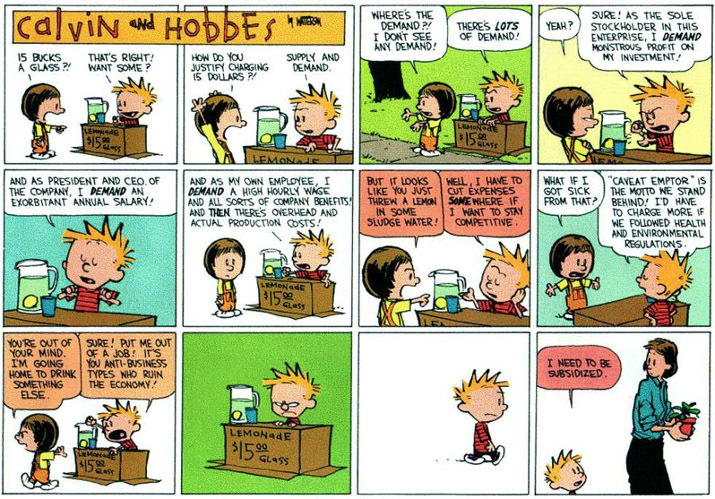 Actually Calvin could grow up and work for Obama... errr.... I mean for Goldman Sachs. Uh huh. Well, nice to see ya Paine, it's been a while. I have been taking a break from the usual blogs, so you haven't seen me in a while either. As far as the cartoon...nice try with the Goldman comment, but there is no doubt which party is indebted to Wall St, big oil, and the greediest aspects of corporate America. It's obviously the Republican Tea Party. Balancing the budget by cutting taxes for millionaires and corporations while slashing pay and benefits for teachers, cops, and fireman is clearly the right wing's #1 agenda. But you should be happy as Obama has clearly become confused about taxes. He listens to the right and somehow - absent any proof or logic - comes down on the tax cuts for the rich side. I'd think you'd be applauding him. Of course, intelligent liberals understand that the US has no budget crisis at all. We have a revenue crisis. Trickle down economics does not work, there is zero doubt about that. Tax cuts for the Koch Brothers and endless war will not solve the problem either. You have got to be kidding me, Dave! We don't have a budget crisis? So if we raise taxes to 90% on all of the millionaires, we will be able to retire our debt and spend on any number of ridiculously asinine and unconstitutional programs, right? Is this what you are saying? Facts are facts, my friend. Taxes have been slashed repeatedly for the last 30 years and we have been in near constant war the entire time. If taxes for the wealthiest 1% had go back to Clinton-era levels (a modest 3% raise) and the disastrous Iraq War had not happened, there would be no deficit. Remember those surpluses W had. Republicans inability to govern is the main reason why we have the problems we have now. If you folks on the right were actually serious about balancing the budget, you would look at all options. Instead, you only look to cut spending on social spending and refuse to look at the revenue side of the equation. To really tackle the issue, we woulds have to eliminate all corporate subsidies, cut the military budget, eliminate corporate tax loopholes, and raise taxes a modest amount on the top 1%. There is no need to fire teachers and cops.